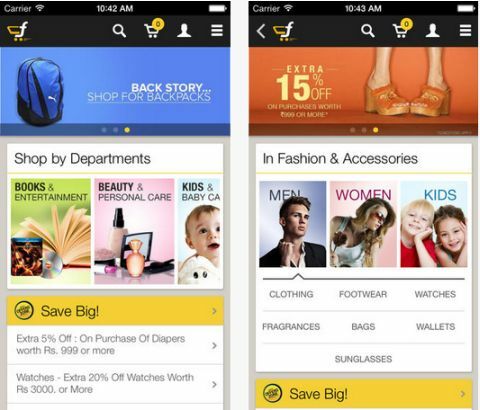 Flipkart a popular online shopping portal in India has released its mobile application for Android and iOS mobiles. Already Flipkart has unique e-books app for Android, iOS and Windows Phone 8 to purchase e-books. This shopping app lets you to browse and purchase all products of Flipkart website from your Android and iOS smartphones. The app allows users to search for products, categories or brands through text and it offers voice searching and barcode scanning also. You can filter your search by type, brand, price, discount and more. The app also provides images for each product with zoom facility. There is all type of payment methods are supported such as Cash on Delivery, Credit cards, EMI and netbanking. Read Also: How to Convert Audio Video Files in Android Phone? Share interesting products with friends through SMS, Gmail, Facebook, Twitter, Google+ etc. The app is available for free on Google Play Store and iOS store, you can download from below links.